The Seattle Department of Transportation ordered 10 new streetcars in the fall, at a cost of $52 million, as it planned to link the two existing streetcar lines with a new line along First Avenue through downtown. The new streetcars that Seattle ordered to expand the downtown streetcar system are heavier and longer than the ones the city now operates, and it’s unclear if they’ll work on the current track and fit in the maintenance barn, Mayor Jenny Durkan’s office said Tuesday. The Seattle Department of Transportation (SDOT) ordered 10 new streetcars in the fall, at a cost of $52 million, as it planned to link the two existing streetcar lines with a new line along First Avenue through downtown. But Durkan halted that work in March and ordered an independent review of the project’s finances, after a Seattle Times report said costs to operate the new system could be 50 percent higher than SDOT had publicly stated. That independent review, by consultant KPMG, was supposed to be completed within 90 days, a deadline that came and went this past month. The projected cost to build the project already has risen to $200 million from what had initially been about $150 million. The KPMG report, the mayor’s office said, found a possible “additional capital shortfall” to build the new line. Durkan’s office has declined to share draft reports from KPMG. It now says the report should be finished in August. “The KPMG analysis was much more complex than initially expected — including the review of thousands of estimates, design materials and correspondence,” Durkan’s office wrote Tuesday. It is unclear if the new streetcars, ordered from manufacturer CAF USA, are compatible with the streetcar system. The city’s contract with CAF USA does allow it to cancel the order, for any reason, provided the city pays for work that’s already done. “It appears the error will require either a change order for design of the streetcars or incur new costs for construction of new or retrofitted maintenance barns,” City Councilmember Lisa Herbold, a longtime skeptic of the streetcar project, wrote in a blog post last week. The streetcars the city now owns and operates are made by a different company, Inekon. The city opted for a new manufacturer after Inekon fell behind schedule on cars for the First Hill streetcar line, which opened two years late. The city asked for a fairly broad list of specifications in the new streetcars, but almost all of the options are longer and heavier than the Inekon cars currently in use. The city’s contract with CAF USA asks for streetcars between 65 and 75.5 feet long. The Inekon streetcars are about 66 feet, according to the company. The CAF USA streetcars are supposed to have a maximum weight of 82,000 pounds to about 95,000 pounds, according to the contract requirements. But the Inekon streetcars are only about 60,000 pounds, according to the company. Both the length and weight requirements for the new streetcars were also changed at some point during the contract process to allow for longer and heavier vehicles. But the new streetcars do not seem to be wider than the current ones. The contract requests streetcars that are 2.45 meters wide (about 8 feet), while Inekon says the current streetcars are 2.46 meters wide. And both sets of streetcars have a track gauge specified at an identical 1.435 meters. Ridership on the city’s two existing streetcar lines has lagged expectations, but SDOT predicted that connecting the two lines with a First Avenue line would cause ridership to soar exponentially. 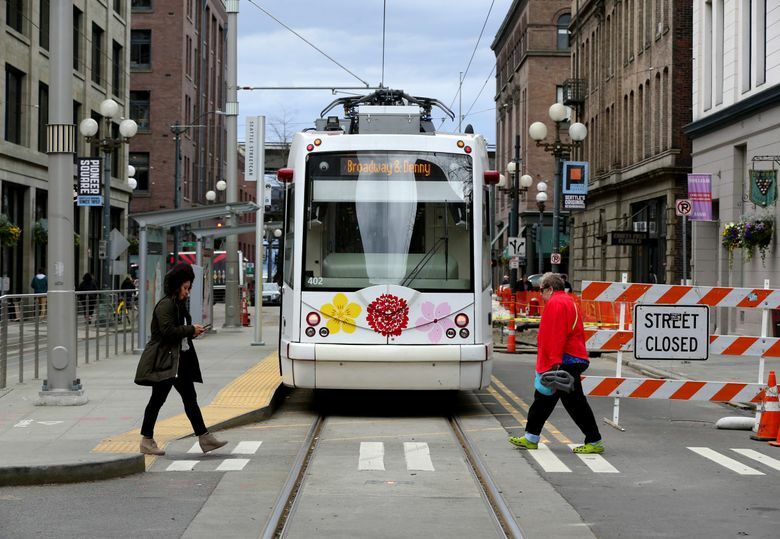 Last month, a coalition of about a hundred business owners and individuals wrote to Durkan, urging her to go ahead with the streetcar project, which they called essential for downtown mobility as the city continues to grow. That coalition met with Deputy Mayor Shefali Ranganathan on Tuesday. The project, they noted, has secured $50 million in federal funding with $25 million more likely to follow. That money would almost certainly have to be returned if the project is scrapped. There is no timeline for a final decision on the project.